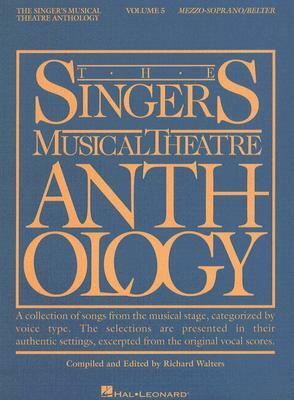 The Singer's Musical Theatre Anthology, Volume 5 Mezzo-Soprano/Belter (Paperback) | The Drama Book Shop, Inc.
(Vocal Collection). The world's most trusted source for authentic editions of theatre music for singers has expanded with yet another volume. Many of the songs are found in no other collections. The 40 songs in each volume are in the original keys, excerpted from vocal scores and piano/conductor rehearsal scores. Includes both recent shows and a deeper look into classic musicals. Includes: THE ACT: City Lights * AIN'T MISBEHAVIN' Keepin' Out of Mischief Now * AVENUE Q: Special * THE BAKER'S WIFE: Meadowlark * BARNUM: The Colors of My Life * BELLS ARE RINGING: It's a Perfect Relationship * CHILDREN OF EDEN: Children of Eden * CITY OF ANGELS: What You Don't Know About Women * THE COLOR PURPLE: Too Beautiful for Words * CURTAINS: Thinking of Him * It's a Business * DIRTY ROTTEN SCOUNDRELS: Here I Am * DREAMGIRLS: And I Am Telling You I'm Not Going * I Am Changing * THE DROWSY CHAPERONE: Show Off * GREASE: Freddy, My Love * GREY GARDENS: The Cake I Had * HAIRSPRAY: Good Morning Baltimore * THE LAST FIVE YEARS: When You Come Home to Me * I Can Do Better Than That * THE LIFE: My Body * A LITTLE PRINCESS: Live out Loud * MAMMA MIA : The Winner Takes It All * ON A CLEAR DAY YOU CAN SEE FOREVER: Hurry It's Lovely Up Here * THE PIRATE QUEEN: Woman * RENT: Without You * SONG AND DANCE: Take That Look off Your Face * SOPHISTICATED LADIES: Hit Me with a Hot Note * MONTY PYTHON'S SPAMALOT: Find Your Grail * SPRING AWAKENING: Mama Who Bore Me * The Dark I Know Well * SWEET CHARITY: If My Friends Could See Me Now * Where Am I Going * TARZAN: You'll Be in My Heart * THOROUGHLY MODERN MILLIE: Not for the Life of Me * TICK, TICK ... BOOM : Come to Your Senses * WICKED: Defying Gravity * For Good * WORKING: It's an Art * ZORBA: Life Is.